Microchipping Fluffy or Fido is one way to help lost pets find their owners. How are pets stolen? Thieves steal animals from anywhere; cars, backyards, front sidewalks, porches, cages and kennels, and pets tethered outside of businesses. Strays and “outdoor” cats and dogs are all at risk. Some thieves even adopt from low-cost shelters and resell for profit. Most shelters use contracts and keep records to “red flag” suspicious individuals. The fur trade: Although the EU and the U.S. banned the sale of cat and dog fur in 2007, the practice continues in the black market. In England, residents noticed certain colors of neighborhood cats disappearing en mass, and discovered fur traders were filling requests for pelts of specific colors and patterns. Laboratories: Some countries (including Argentina, Italy, and Israel) have banned the use of animals for experimental purposes, but the practice is still legal in the U.S. Most lab animals, including cats, are raised specifically for these purposes, but unscrupulous people called “bunchers” collect and sell “under the table” to equally unscrupulous vendors. Note: 16 states in the U.S. now allow college students the choice of a “virtual dissection” lab. Pet flipping: This latest trend, where stolen animals are advertised for sale on line, is called “pet flipping.” Craigslist bans “selling” pets, but allows charging a “re-homing” or adoption fee. One woman saw her dog advertised, went to meet the seller, excused herself to “get money from the ATM,” and called the police. 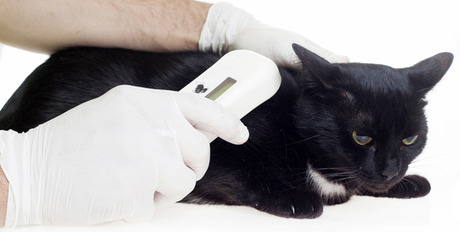 Protect you and your pet: The foremost recommendation from animal welfare experts is to have your pet(s) microchipped. Clinics, shelters, police, and animal control offices have scanners that read the chip and pull up your contact information. (Remember to update changes in your contact information with your microchip company.) Have your photo taken with your pet, and make sure her veterinary records are up to date and available. If you own a purebred and don’t intend to breed or show, spaying or neutering makes them less valuable to thieves who sell for breeding. Never leave your pet unattended, and use good combination locks on gates at home, and on cage doors at shows. If you’re adopting an animal, have them scanned to prove ownership of the seller, or adopt from a shelter (they scan all animals). For “found” pets, ask for proof of ownership before relinquishing. And if you are re-homing a pet, avoid “free to good home” advertising and ask for references (such as the person’s veterinarian) before adopting. Educating ourselves can help us combat this dark reality, and increase safety and peace of mind for us all.